The record of birth for yet another child of Anthony’s that I did not know about: Kate Maguire, born 23 June 1872. That makes 15 kids from one man! Damn, Anthony! Some thoughts on the first thing: wife and mother, Bridget died less than a month after Kate was born. Do I assume that Kate died too? She was not on the next census in 1875, and there was no death record for her that I could find. Was she given away or put in an orphanage? (did they have orphanages back then?) Was she sent to live with a relative? While I was there, I was determined to get actual photocopies of the records I found. The last time I did this, I only transcribed the birth and death records, because there were quite a few that I was interested in, and these record books are quite large and awkward for copying. But I find that I second guess some of my transcriptions after the fact, and so I must get photocopies, if at all possible. So I asked, and at first the woman helping me said something like, “Oh, I don’t think we can do that”. But somehow it turned into, “Sure, that’ll be $2 a copy”. (Quite the deal, compared to Sibley county, where they’re something like $9 a copy!). So I came away with those two records, plus a photocopy of the death record for Bridget Maguire (not a new-to-me record). I finished up there sometime before 11am, and then headed over to the McLeod County courthouse in search of probate records for Anthony. I don’t know if they exist, and I don’t know what to expect to find in them, but I hear these records are often overlooked and can contain some good information. When I got there, I was told that there was nobody working in Probate today, so they weren’t sure what they could give me – “sorry”. Meh, whatever. On I went. Then to Gaylord, for the Sibley County courthouse. First to Probate, where a kind woman tried to help me. They didn’t have records as old as what I was looking for; they had all been sent to MNHS for archival, but she did have an index, which did not contain Anthony’s name. I still might check out the records at MNHS, though. Moving on, I thought I would go back to the third floor to get photocopies of some vital records that I only typed up last time. But more disappointment: they no longer make photocopies of the ledger style books. So, I looked through a few books, to see if my eyes would spot anything new — they didn’t, and then moved on. So now, in addition to my castle, I have a convenience store. I thought I might go to MNHS today to search for more obituaries. I didn’t decide to go until sometime after noon, and didn’t end up getting there until shortly after 1pm. I had until 4pm to dig through papers. And the night before, I had only briefly considered what I might try and find. I thought I might look for Bridget Cafferty’s obituary. But I didn’t have high hopes of finding it; she died in 1872, and MNHS only had 1 paper for McLeod County during that time (Glencoe Register) that I could check. So I checked it, and nothing. So then I spent some time pulling up the obituaries I found last time. The last time I was here, I was definitely not a good genealogist. Sure, I copied all of these obituaries, but…I forgot one important piece: the things needed for citing sources! So I looked them all up again and copied down page numbers, volume numbers, column numbers, and what have you. Now my research can be all proper, and reliable. O’Meara’s new building was formally opened on Friday. He is now ready to serve customers in the most approved style. Sibley County Independent, Friday, October 20, 1882. No. 28. Page 1. Column 2. DIED. – At Henderson, October 17, 1882, of diphtheria, Hannah O’Meara, daughter of James O’Meara, aged 4 years. Sibley County Independent, Friday, May 12, 1882. Vol. 10 No. 5. Page 1, Column 1. Also, Mr. Michael O’Neil, of Faxon, to Miss Mary E. Cunningham, of Green Isle, sister to Mrs. O’Meara of this place. Sibley County Independent, Friday April 14th, 1882. Vol. 10. No. 1. Page 1, Col. 3. 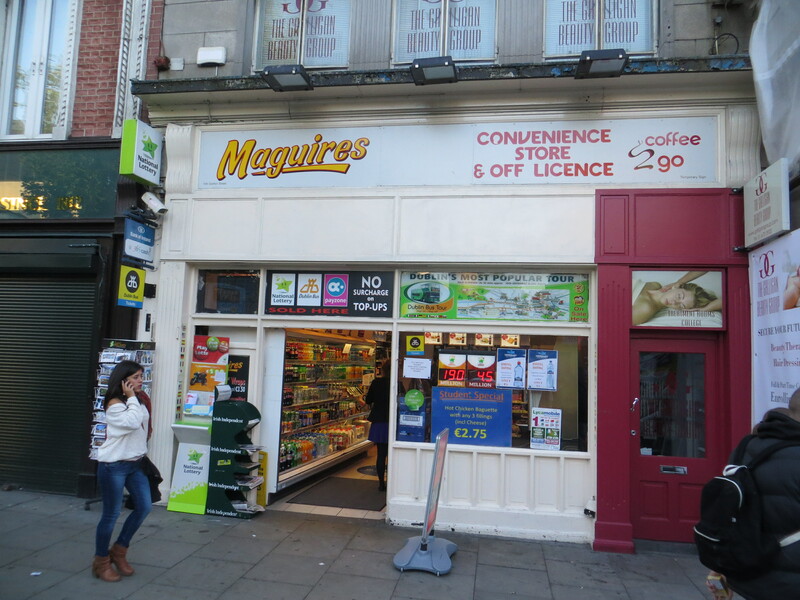 DIED– Mr .Patrick Maguire, on Saturday the 1st inst. Sibley County Independent, Friday April 7, 1882. Vol. 9. No. 52. Page 1. Col. 1. DIED — Of typhoid fever, at Green Isle, on the 1st day of April, Patrick McGuire, at the age of 58 years. Patrick McGuire is sick with a fever which accounts for the apparition he saw last week. We understand he is very low to-day. Sibley County Independent, Friday March 17, 1882. Vol. 9. No. 49. Mr. Patrick McGuire was taken seriously ill last week and imagined he saw a man on horseback without a head standing at his stable door. I think next time, I might keep going back in the Sibley County Independent? Or I might try the Green Isle Record, but that one doesn’t go back this far, so I’m not sure how helpful it will be (unless I can dig up some crap on Anthony’s children?). No research next Saturday, as it’s the annual MN Irish Fair!